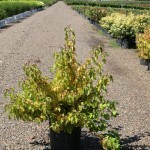 This is an upright, rounded shrub with fiery yellow-orange branches in the winter. The leaves emerge in spring with a bronze-yellow color, mature to bright green, and change to bright yellow-orange in the fall. 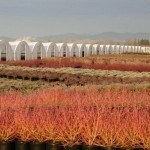 Plant it where the bright stems can be enjoyed in the winter. Great planted in masses. It prefers a moist, well-drained soil. Prune as needed to promote fresh growth of the stems. It can sucker freely to form a colony.